Yesterday, we hit the farmer’s market at Pepper Place, which specializes in locally grown, organic vegetables, eggs and meats along with a variety of baked goods and offerings from local artisans. For those of you unfamiliar with Birmingham, Pepper Place is the old Dr. Pepper bottling plant that was saved from the wrecking ball and turned into an assortment of artisan shops, antique stores, architectural stores, design firms, etc. Needless to say, we stocked up on all sorts of wonderful organic vegetables. Included in our haul were heirloom tomatoes (which I have a great salad recipe for that I’ll share in a future post), rattlesnake beans, yellow wax beans, lady peas, fresh okra, silver queen corn, heirloom potatoes and some beautiful Swiss chard. In a sauce pan, heat the olive oil over medium heat. 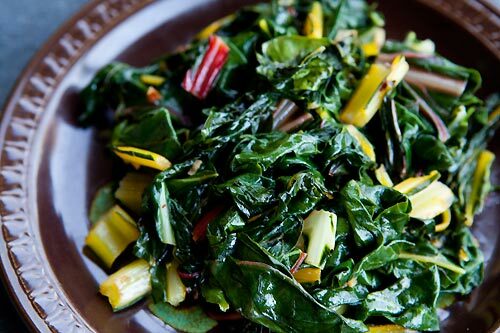 Chop the stems of the chard into small slices, like you’re chopping celery to make chicken salad. Once the olive oil is hot, add the chard stems and the onion and cook, stirring occasionally, for 5-6 minutes or until chard stems and onion are tender. Add the garlic and cook 1 minute more, then add the chopped chard leaves and cook one more minute to wilt the leaves. Sprinkle with salt, then pour in the white wine (which will flash off the alcohol) and cook 1 minute uncovered, then loosely cover the pan (a fitted top tilted to let out steam works just fine) and continue cooking for 10 minutes. That’s all I did and it was delicious. The taste profile was more like fresh spinach than other cooked greens, which is why you don’t have to boil this on the stove for hours on end like you do with turnip greens, collards, kale or Poke Salad. Yes, here in the south, we cook that wild weed called poke salad. The only thing I’ve never seen anyone cook (although I’ve heard some people do) is kudzu! This entry was posted in Vegetable Side and tagged bacon grease, chard, garlic, organic, pinot grigio, sea salt, vidalia onion by quarlj01. Bookmark the permalink.